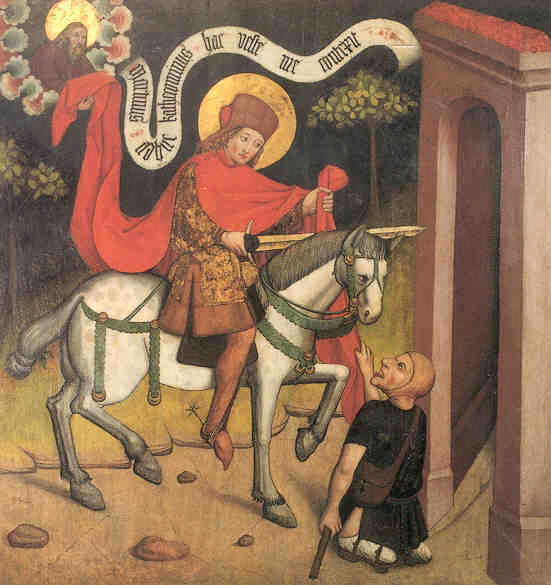 Continuing on with our consideration of some of the customs associated with this time of the liturgical year, one which is coming upon us soon is the feast of St. Martin of Tours, the fourth century Roman soldier who was to become a bishop, celebrated on November 11th. His feast is traditionally referred to as Martinmas. In the Handbook of Christian Feasts and Customs, Fr. Francis X. Weiser, S.J., first considers some of the history of this time. He notes that with Christmas being "one of the main feasts of the Christian year, a spiritual preparation soon began to be held." From the Church in Gaul comes the first news about a definite period prescribed for this preparation. Bishop Perpetuus of Tours (490) issued the regulation that a fast should be held on three days of every week from the Feast of Saint Martin (November 11) to Christmas. The name Advent was not yet used for this preparatory period; it was called Quadragesima Sancti Martini (Forty Days' Fast of Saint Martin's). 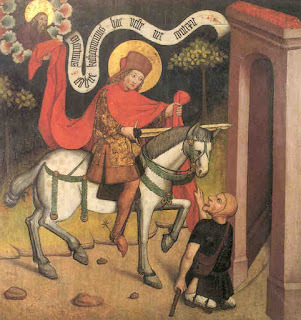 The most common, and almost universal, harvest and thanksgiving celebration in medieval times was held on the Feast of Saint Martin of Tours (Martinmas) on November 11. It was a holiday in Germany, France, Holland, England and in central Europe. People first went to Mass and observed the rest of the day with games, dances, parades, and a festive dinner, the main feature of the meal being the traditional roast goose (Martin's goose). With the goose dinner they drank "Saint Martin's wine," which was the first lot of wine made from the grapes of the recent harvest. Martinmas was the festival commemorating filled barns and stocked larders, the actual Thanksgiving Day of the Middle Ages. 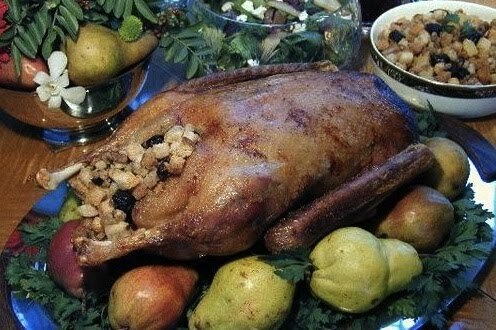 Even today it is still kept in rural sections of Europe, and dinner on Martin's Day would be unthinkable without the golden brown, luscious Martin's goose. It is worth noting that the observance of these traditional foods and customs are yet very much alive in parts of Europe today. Aside from the Martin's Goose, here is an image of a Martinmas parade in Germany which sees children walking through the streets with their specially prepared Martinmas lanterns. The children go in procession through the streets asking for sweets and singing songs about St. Martin, sometimes even being led by a figure dressed as St. Martin on horseback. In Germany, the traditional sweet of Martinmas is "Martinshörnchen", a pastry shaped in the form of a croissant, which recalls both the hooves of St. Martin's horse and, by being the half of a pretzel, the parting of his mantle. Customs as these are a very fine and traditional way to tie ourselves to the Church's liturgical year. 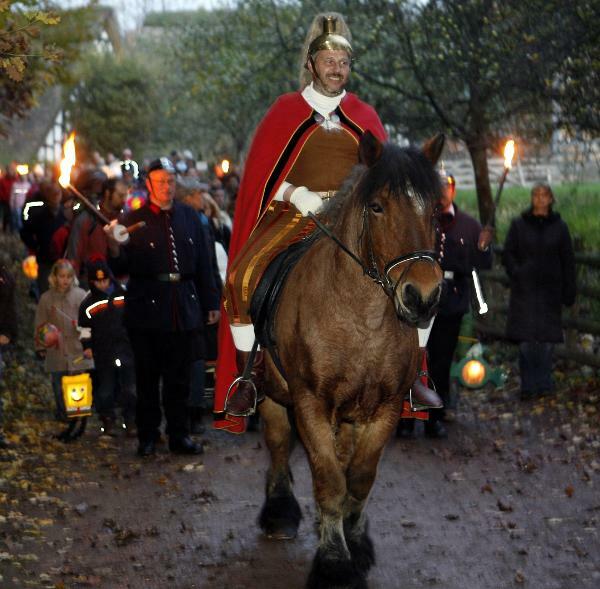 Why not enjoy some Martinmas goose and wine this November 11th with family or friends?